appear to emanate from a certain point in the sky called the radiant. the same manner as the sun and moon. 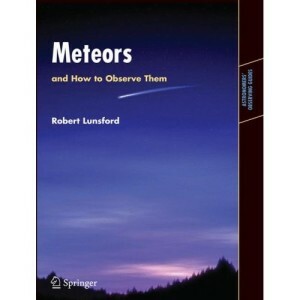 Since meteors are a transient phenomena one cannot go outside at night and expect to see meteor activity. This is especially true during the evening hours when the Earth is moving in the opposite direction from the sky seen above during those hours. At this time of night meteoroids (meteors in space) must catch up to the Earth in order to enter the Earth’s atmosphere. Therefore meteor rates are lowest near 1800 (6:00pm) local time. Conditions for viewing meteor activity improves as the night progresses. At midnight a great majority of the meteors seen strike the Earth from a perpendicular angle instead of from behind. These conditions offer better rates than witnessed early in the evening but the general activity is still low when compared to the morning hours. During the dark morning hours the Earth is rotating toward the direction it moves in space, known as the apex. During this time the Earth slams head-on into meteoroids and many more will be seen. This is much like a vehicle driving through the rain. More raindrops will strike the front windshield compared to the rear window. The peak meteor activity occurs near 0600 local time. During certain times of the year the major meteor showers are active and increase the nightly activity several fold. This is especially true if the moon is near its new phase and not brightening the nighttime sky. The list of these showers is provided below (see the class I showers). half moon. Picture courtesy of Maurizio Eltri, (Unione Astrofili Italiani Sezione Meteore). To keep current on the upcoming meteor activity the Meteors Section invites you to subscribe to their quarterly newsletter, available for the price of postage (currently 55 cents per issue). To subscribe contact our section coordinator Robert Lunsford. Class II: reliable minor showers with ZHR’s normally two or better. Showers, a FAQ sheet containing more in-depth information on this topic. 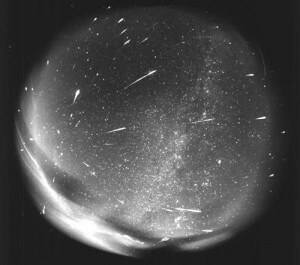 A weekly newsletter describing the meteor shower activity for a given week. Fireball Reporting Form, Report exceptionally bright fireballs.